The silicone rubber jaws of the Deluxe Reacher can hold a dime! Why do shoes always end up under the bed, and the pens we drop always roll far under the desk? How come kitchen cabinets always have an impossible-to-reach high shelf? Sometimes reaching to pick things up can be a problem—but not if you keep a reaching aid handy. They're great for pick-ups or lots of other jobs that require a long reach. We even use 32 inch and a 42 inch Deluxe Reacher to pick up twigs in the yard and low fruit on trees, and a 22 inch model in the car to get stuff from the floor and the back seat! The 22 inch model is also great for people who use a wheelchair or scooter. All Deluxe Reachers are considered unbreakable, and carry a lifetime warranty. These are not to be confused with a widely-advertised model, sold on TV and in stores, for under $10, that has also rubber suction-cuppy-looking tips. Those models break easily. A few customers may wish to have a deluxe reacher with a locking mechanisms to lock the jaws in the closed position when desired. We used to carry the deluxe reachers with lock, but now carry them without a lock because many customers found the lock to be an inconvenience, locking sometimes when you don't want it to, if you are in a hurry. If you prefer a deluxe reacher with a lock, please call us and we be happy to take a phone order; it costs $4 more and it will take typically three weeks to get it for you. 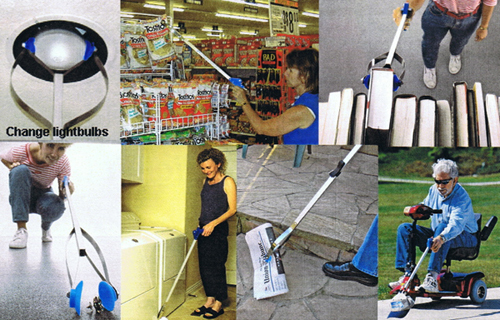 All Deluxe Reachers also come with a Velcro©-type hook-and-loop fastener that helps in tethering it to an object such as a scooter or wheelchair, or to hang it up on the wall, etc. The Deluxe Reacher excels in so many things . . . The Standard model is better than the Deluxe at picking up paper clips and small scraps of paper on the floor, and fits in very narrow places, like between a washing machine and dryer. It can go into tight places (behind furniture close to the wall, for example) better than the Deluxe Reacher, because it has a narrow jaw. It is not good at picking up cans, heavier or larger items. The jaws are not as rugged as the Deluxe Reachers. For general use, we prefer the Deluxe Reacher, but now and then there are things that the Standard does better, and some customers prefer them. Finally, the Pocket-Fold model comes apart in the middle, so it will fit any bag that is longer or deeper than 12 inches. When assembled, it extends your reach by 22". Good for delicate or small objects. It is not good at picking up cans, heavier or larger items. The jaws are not as rugged as the Deluxe Reachers. 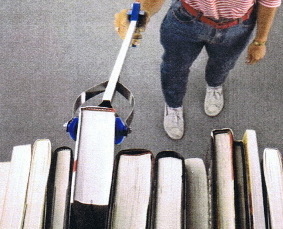 Photos show the Pocket-Fold reacher collapsed for carrying in a bag; and then put together for use. For car, nightstand, kitchen. Great for wheelchair or scooter users. Note: Reachers longer than 22"
Reachers longer than 22" cannot be shipped economically by air. If you order one and specify either second day air or next day air, we will ship it by ground and refund the appropriate portion of the S/H charges that were billed to your card that represented the air portion of the charge. Because of the length and volume of the cartons that must be used to ship the longer reachers, the air shipping charges from UPS become comparable to, or even exceed the cost of the item itself. International Orders: Because mail regulations require Int'l Priority Mail (a type of air mail) for items of this length, it is very expensive to send this item to countries outside the U.S. Contact us for a specific quotation if you want to order one.